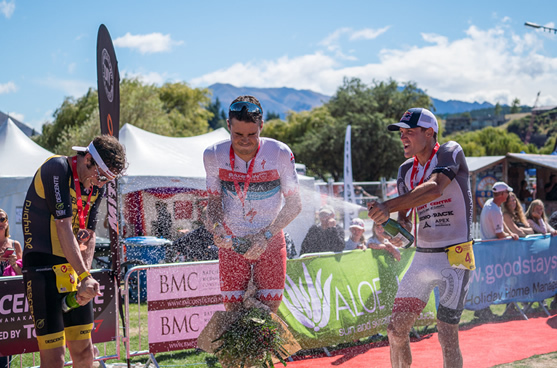 Coming off the back of Challenge Wanaka in February this year was a huge high. Having the opportunity to race against Javier Gomez was always a dream of mine and to come so close to winning and to also have to push that hard was something I was really proud of. For me Javier is one the most accomplished and talented 70.3/half distance triathlon athletes out there. I was really happy to come away with a close result and I felt like pushing myself that hard two weeks out from Ironman NZ, was exactly the lead up I needed to my key race of summer. But, life doesn't always go to plan and I was unfortunate enough to catch a cold, 7 days out from Ironman NZ. I tried to stay as positive as possible in the belief that once I started racing the adrenaline would at some point over power the illness, and that I would be able to find enough in the tank to gain a good result and earn enough points to ensure my place on the start line at Kona. I was already half way there with the points I needed for Kona so it was only this race that I need to perform at to be able to secure my place on the start line, and avoid the pressure box that starts to come into place once the July points deadline gets closer. However it was to remain clear after feeling incredibly flat in the swim, but still having to lead the front bunch as no one else was willing. Once I was on the bike that sinuses ran true and the full signs of sinus infection came to light. My power numbers and willingness to suffer through it had diminished significantly. This was a really hard outcome for me to take as I have never been one to back away from a challenge and this was only the second time in my 8 years racing that I have had a DNF result. I have always been a believer that you can't let these things set you back, or make any decisions that are based on an event where you were not performing at 100%. For this reason I chose to take the time off when I had it planned, refresh, and enjoy some of the things I love the most. I have just returned from one of NZ's most renowned multi-day mountain bike trips, the Old Ghost road linked together with the Heaphy trail over a couple of days. A trip like this is really fulfilling for me and challenging myself in the backcountry gives me the fuel I need to dedicate to the hard yards that are inevitably coming. I'm now in my 4th week of training again and it's all going well. The downtime gave us the opportunity to make sure that we take all the learnings from the last 12 months and integrate them into my training plan moving forward. I feel like I am in a really good place both training wise and for the next race. I will fly to Cairns on the 1st of June to acclimatize to the humid hot conditions and also to do my final push leading into Ironman Asia Pacific Championship. I am really looking forward to racing Ironman Asia Pacific, as this is an event I competed in last year and really enjoyed it. I finished with in 3rd last year, but I know this year's depth and strength of field will see one of the most competitive pro fields outside of Kona lining up together. For me I have to achieve a top 5 to gain enough points to ensure my place at Kona and to prove to myself as much as anyone else that I have the ability to race at this level. The rest of the seasons plan will be defined by the result in Cairns. But if all goes well, my next focus after Ironman Asia Pacific will be the 70.3 Asia Pacific Champs in Cebu in early August, backed up by the 70.3 World Championships in South Africa in early September. From there I will go into a 6 week build towards Kona.